At the heart of Sani Spoors is a bunch of local farmers who are passionate about mountain biking and about the beautiful area that they live in. 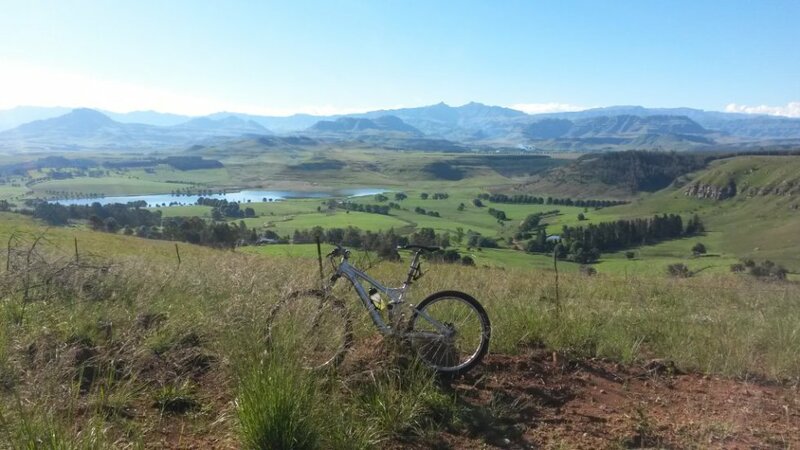 They want locals and riders from all over the country to be able to come, experience, share and enjoy what they have here in the Underberg area. The pristine dairy farms dotted along the Umzimkulu River and its tributaries with the cows feeding in the green pastures and with the backdrop of the Ukhahlamba Mountains and the surrounding World Heritage site is just a spectacular and magnificent setting to be out in the crisp fresh air riding on a mountain bike. The vision is therefore to create a system of trails on the working farms, catering for all skills levels, that will allow riders to enjoy and “share” the area, while co-existing with the on-going farming operations. This co-existence places responsibilities on both the farmers and the riders and hence no riding can take place without a rider indemnity having been signed and the requisite fee having been paid. Whilst Sani Spoors is not a commercial operation as such – the rider revenues are needed to help subsidise the substantial on-going maintenance of the bridges and trails. So, just over five years ago, the farmers who owned the land started the Sani Spoors trails from the site of what is now known as The Olde Duck (was the Duck and Dolittle and then the Duck and Spoors) – which is situated about 7kms out of Underberg (2kms on the Drakensberg Gardens road). Find out more on how much trails cost, where and how to pay, by clicking here. The Olde Duck (2kms on the Drakensberg Gardens road) is the base venue for all the Sani Spoors and Riverlea trails. There is an ablution block available on site consisting of several separate and very comfortable change rooms – each with a hot water shower, toilet, basin, mirror and bench. The Olde Duck with its friendly but country style service (this is not big city fast food!!) serves excellent cappuccinos (proudly created by the resident barista) and fine food. There is an option to sit inside with the lilting music and serene setting or in the beautiful sunshine – watching the kids feed the animals in the animal farm; play on the jungle gym; or ride their bikes around the specially created kiddies track. A truly legendary setting. The Vanilla Rose gift and clothing shop is also on the premises, and is well worth a visit. The items on sale are unique – specifically and personally selected and sourced by owners Jeannine and Di from around the country. It is unlikely that you will manage to walk out of there without having bought something! The Sani Spoors clubhouse with bar, built in braai (to sadly replace “Old Smokey”), fireplace and lounge is also on the Olde Duck premises is but only used for social activities – most often on a Thursday evening. Many a good story about the Tour de Tuli, Sani2c, Wine to Whales, Epic, etc., has been told here over the odd beer and/or bottle of wine/whisky. Very special place!! On signing of the mandatory Indemnity Form and payment of the requisite fee (see below) at The Olde Duck, the Sani Spoors trails are available to mountain bike riders, trail runners and walkers. (Off-road motor bikes are strictly prohibited!). Hilda will help you with the mandatory signing of the indemnity form and payment of the fee which takes place at The Vanilla rose (same venue as The Olde Duck) – which is open during normal working hours and on Saturdays and Sundays. Hilda will issue you with a number board the needs to be attached to your bike/self. It has the necessary emergency numbers on it. Should you wish to ride when the Vanilla Rose is closed then it is up to you to sign the indemnity form and pay the requisite fee – payment by Zapper is available. In this instance it is implied & understood by you that you are alone with no emergency services available. View more of our area attractions, great places to eat and cosy accommodation in Underberg, kwaZulu-Natal.